I’ve been meaning to seek out the items for this post for a couple of years and Memorial Day seems like a good time to share – following my last What’s Old is New featuring outfits from A Day at the Races, I’d like to look at some of the costuming choices in Groovie Movie and note where you may find similar items in modern times to hone your 1940’s-inspired dance pieces. As this was a film made during World War II and the film features some the male dancers at the end wearing military uniforms, this appears to an excellent film to highlight, in the spirit of Memorial Day. 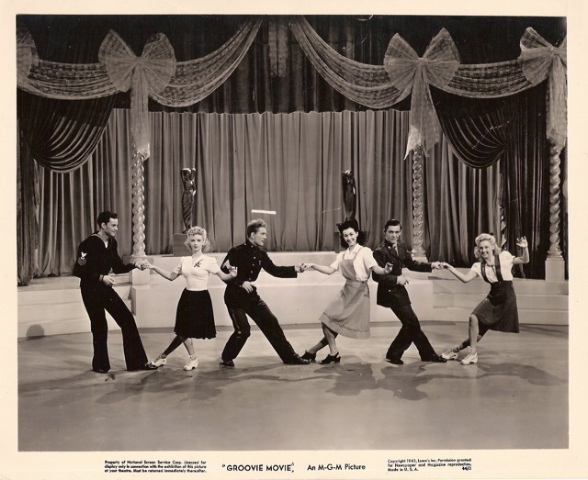 Jitterbugs, veterans, and those who served our nation with honor – we salute you! I’m going to focus on some of the followers’ outfits at the end of the film because some of the earlier outfits were more…to prove a point or to further the narrative. 🙂 For military garb, that’s a bit of a can of worms. Visit your local army/navy surplus for inspiration, talk to your grandpa, or delve into the potentially very expensive (and very specific) hobby of collecting vintage uniforms. Jitterbuggin has a great jumper/pinafore that’s similar to the one Irene Thomas is wearing in the clip. A jumper similar to the one worn by Kay Vaughn (Smith) in the clip, courtesy of Time Machine Vintage on Etsy – adorbs! And it looks like Time Machine Vintage has Kay’s number – Kay’s shirt is a little harder to discern, but it looks like a button-down with some sort of tie at the neck. Request in white sans lace for your Groovie Movie homage. This bow looks like it’s about the right size. 🙂 Courtesy of Whispy Love on Etsy. Jean Veloz’s fitted V-neck shirt with ruching on the front is the most difficult – I still can’t find a good reproduction, or even a pattern I feel comfortable identifying as “close.” In terms of closeness, this pattern is about as close as I could get. Find a seamstress friend or Etsy seller for hire and get to work. I’ve looked at the blurry image of Jean’s brooch on her blouse long enough that I’m fairly certain it’s a flower (though witch on a broomstick was a close second) – search eBay for “1940 flower brooch” and the options are plentiful! Wedges for everyone! Get yours before Dancestore.com discontinues them – available in the sale section, in black and brown. I couldn’t find ankle tie wedges, so these ankle straps will have to do – from Cruisin Australia. Jitterbuggin Sale Now Through Saturday! 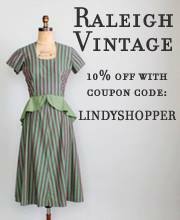 Time to stock up on some fabulous reproduction garments, hand-made in Portland, Oregon by one of our own! Jitterbuggin’ is having a 25% off sale today and tomorrow (that’s July 3 and 4) to keep the inventory rolling so the fabulous Kimberly Cullins can do awesome things with the new fabrics she got in this week. A little birdie told me there are some awesome new prints, including two cat prints, which I am dying to see, so….we should all help Kim keep the ball rolling and pick up something from the Jitterbuggin store! Use the code “Rolling Stone” to get the 25% discount. I’m definitely picking up one of her Belmont A-line 1940’s skirts. While I already have a green repro jumper, I couldn’t resist posting this Jukebox DJ Jumper available at ModCloth – high waist, potential twirly skirt, little green buttons on the front, just adorable. Pair with just about any blouse! My search results have been futile, even with the help of my wonderful friends via Facebook, for this fantastic jumpsuit from H&M, which appears to have come out sometime just prior to August, 2011. The jumper, pictured here and modeled by the stylish author shown as SP in this article, is identified as part of a trend towards 1970’s clothing, but the cut and design of this jumper, with the floaty sleeves, cinched waist, and, wide legs is more 70’s does 1930’s beach pajamas. Beach pajamas at H&M in an adorable print? Yes, please! I’ve highlighted the adorable reproductions made by Etsy seller Jitterbuggin in the past, but I think she’s really hit her stride with these new (since my last post) matching 1940’s jumper and blouse sets in blue and green. I’m linking to the jumpers, as the blouse must be purchased separately, and all are available in multiple sizes. Everything about the sets is just fantastic, the pocket details on the jumpers, the line of the skirts, the fabric choices for both the jumpers and the blouses (especially the airplanes! ), and the contrast collar and sleeve bands on the green blouse. On top of that, Jitterbuggin shows you how to wear it by styling her models to the hilt, with period hair, hosiery, shoes, red lips, hair flowers, and bakelite accessories. Very Groovie Movie! 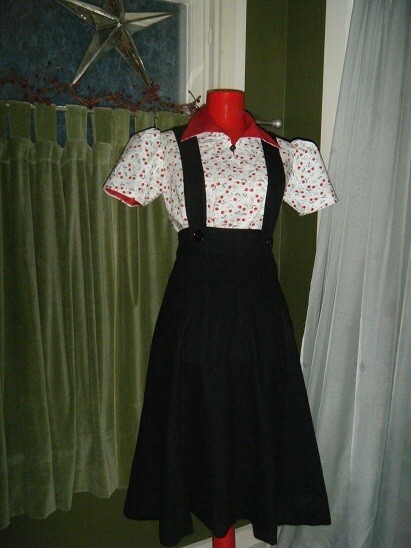 Just a reminder that we are still conducting a silent auction for this wonderful 1940’s reproduction jumper and cherries print blouse to raise money for The Carolina Fascinators – bidding ends tomorrow at 11:00 p.m. All the auction details and the auction itself are in the LS post from Monday. The bidding is only up to $45.00 – less than the value of just the blouse itself! Did I mention this outfit is one of a kind? And that, by wearing it, you’ll reach an astronomic level of cuteness? 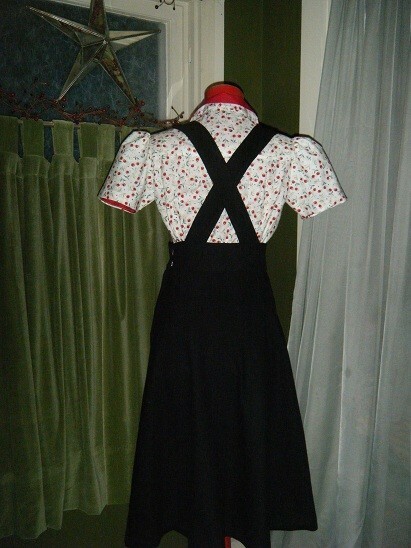 1940’s Reproduction Jumper and Cherries Blouse – Fundraiser for The Carolina Fascinators! 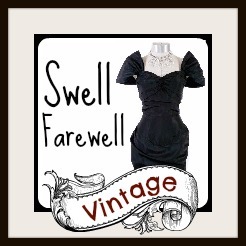 One of my favorite Etsy sellers, Time Machine Vintage, has generously donated this lovely reproduction 1940’s jumper and cherries blouse to The Carolina Fascinators‘ fundraising efforts. I will be conducting a silent auction on this blog for the jumper and blouse set – simply place your bid in the comments section and whoever has the highest bid at 11:00 p.m. on Saturday, March 12, 2011 will be the winner. The jumper and blouse will be on display at the Triangle Swing Dance Society Dance on March 12 at the Carrboro Century Center and The Carolina Fascinators will be taking bids at the dance as well (with updates posted here during the dance, in case you are not local and want to bid at the end). The jumper and blouse were made to fit a modern size 6-8. The waist on the skirt is approximately 27 inches, but might fit a 28, as there’s some room to move the fasteners over. The amount of space in the hip area is generous and will drape nicely to fit. The blouse will fit up to a 36C bust and around a 34 bust, with the waist in the blouse being more generous than the skirt. If you have any questions about measurements, please let me know and I’ll be happy to measure the garments. The outfit looks even more adorable in person, I’d bid on it myself if it was my size. I love the contrast collar, the big buttons on the jumper, and that the jumper straps cross in the back. The jumper has 8 gores in the skirt, which means maximum twirly-ness and dreaminess! Who are The Carolina Fascinators, you ask? TCF are a ladies jazz dance performance troupe based out of Raleigh and Durham, North Carolina, specializing in routines inspired by the vintage dances of the 1920’s, 30’s, and 40’s. We have hit the ground running, but are still a very new organization and need funding for travel, costumes, and practice space. The local dance community has been very generous thus far at our bake sales and we hope that you will help us out in this latest fundraising endeavor! I’ll add that Time Machine Vintage is also making The Carolina Fascinators’ next costume and she has been so wonderful to work with during the process of costuming five gals. The fine print: If you are bidding online, we will accept payment only through PayPal. Shipping in the U.S. will be $8.50, please email me for an international shipping quote at caab241@gmail.com. Payment due within two days of the auction ending.